The World of Cyborg 009. 3.The World of Cyborg 009. Once you step into the permanent exhibition area, you will encounter the cyborg soldiers’ laboratory. Music and video effects will draw you into the world of Cyborg 009. Kamen Rider masks from the live action Kamen Rider show, from Kamen Rider 1 to Kamen Rider Ex-aid are on display. A monitor near the masks shows the opening scenes from the series. 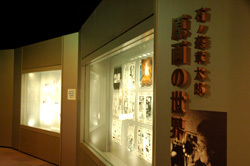 Exhibitions of original manga in various themes from the museum archives. Visitors can observe the delicate touches of Ishinomori’s penwork and the striking content of his works. At Kikaider’s corner, light intersects with sound, where visitors will witness the birth of Kikaider. Will you be able to find the switch? 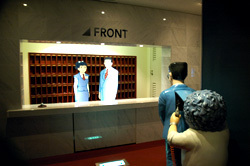 The front desk of Hotel Platon actually exists inside Ishinomori Manga Museum. What??!! Mr. Matsuda was really a robot?! Next to the reception desk, you can take a Hotel Personality Test. The last exhibit in the permanent exhibition area is Ishinomaki’s own hero, ‘Seajetter Kaito’. 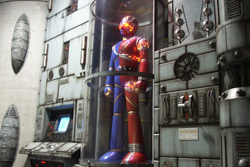 Here visitors will experience the world of ‘Seajetter Kaito’ and find everything they need to know about the superhero. The specially made Seajetter Kaito diorama is a must see.